Two ultra-high vacuum VT-SPM Omicron microscopes. 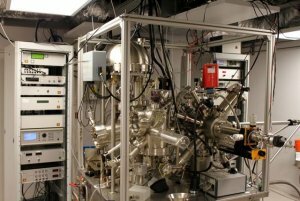 They allow us to image and study the electronic properties of surfaces down to the atomic scale in tunneling current mode (STM, topography and spectroscopy) or in atomic force mode (contact and non-contact AFM). They are controlled by the Matrix version of the Omicron electronics or by the Scala one. A heating stage and a He cryostat provide access to a range of temperatures from 30K to 800K in imaging conditions. The chamber containing the head of the microscope can accommodate evaporation cells in direct line of sight of the sample. A SPECS 1D-delay line photoelectron analyzer with an dual anode x-ray source. a chamber designed for high pressure exposures (p>10-4mbar). The UHV systems are equipped with pumping and bake-out systems as well as various pressure gauges. All transfers are compatible with Omicron sample plates. An UV-visible differential reflectivity spectroscopy experiment (200-1100nm) allows in situ monitoring of evaporation or exposure to gas. A software ’GranFilm’ was developed to calculate the Fresnel coefficients for layers of nanoparticles.